An electron microscope image of a cross-section of the novel perovskite solar cell showing the bundles of nanotubes, which have become half-loose as part of preparing the samples for imaging. Image: Aalto University/University of Uppsala/EPFL. Five years ago, perovskite solar cells started to challenge traditional silicon cells with a cheaper and simpler manufacturing process that used less energy. Methylammonium lead iodide is a metal-organic material with a perovskite crystal structure that captures light efficiently and conducts electricity well, both important qualities in solar cells. However, the lifetime of solar cells made from metal-organic perovskites has proven to be very short compared to cells made from silicon. Now, researchers from Aalto University, Uppsala University and the École Polytechnique Fédérale de Lausanne (EPFL), all in Switzerland, have managed to improve the long term stability of perovskite solar cells. 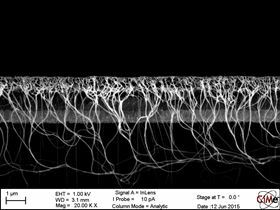 They have done this using ‘random network’ nanotube films developed under the leadership of Esko Kauppinen at Aalto University; these are films composed of single-walled carbon nanotubes that in an electron microscope image look like spaghetti. The researchers report their findings in a paper in Advanced Materials. In the study, thick black films of carbon nanotubes, with conductivity as high as possible, were used in the back contact of the solar cell, where light does not need to get through. According to Aitola, however, these nanotube films could also be made transparent and thin, making it possible to use them as the front contact of the cell, in other words as the contact that lets light through. The lifetime of solar cells made from silicon is 20–30 years and their industrial production is very efficient. Still, alternatives are needed as deriving silicon from the silicon dioxide in sand consumes a huge amount of energy. It is estimated that a silicon solar cell needs two to three years to produce the energy that was used to manufacture it, whereas a perovskite solar cell would only need two to three months. The nanotube film-containing perovskite solar cells are also interesting because of their inherent flexibility. Flexible solar cells have until now been manufactured on conductive plastic, but the flexibility of nanotube films is superior to conductive plastic and the raw materials are cheaper. Thanks to their flexibility, these solar cells could be produced with the kind of roll-to-roll processing technology used by the paper industry. “Light and flexible solar cells would be easy to integrate in buildings and you could also hang them in windows by yourself,” says Aitola. This story is adapted from material from Aalto University, with editorial changes made by Materials Today. The views expressed in this article do not necessarily represent those of Elsevier. Link to original source.